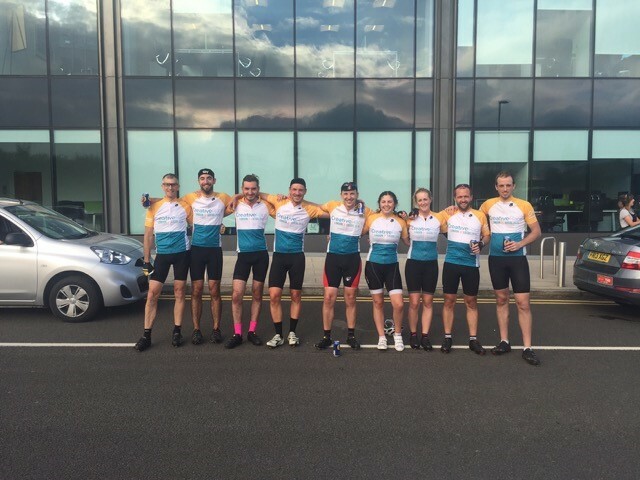 A team of nine cyclists from creative communications agency CreativeRace, has completed a gruelling cycling challenge travelling from the company’s offices in London to its head office in Leeds. Travelling 231 miles, the team departed from the office in Charlotte Road, Shoreditch at 8.15am and arrived at the offices on Whitehall Road, Leeds at 5pm the following day. The brainchild of account manager, Ben Norman, the London-Leeds ride has been in the planning since the beginning of 2016 to raise money for charity. The challenge, which has so far raised £2,200, also coincides with the first year anniversary of the company’s rebrand from Gratterpalm to CreativeRace and the team comprised employees from across different departments at the creative agency ranging from creative design to financial and HR. The charities to benefit from the initiative, the Yorkshire Air Ambulance and St Gemma’s Hospice, were voted for by the staff at CreativeRace. Ben said: “It’s really nice that we’ve accomplished this physically demanding challenge and raised an impressive sum for local charitable causes in the process. The experience is real testament to our teamwork as we worked together to complete the challenge. “The team included experienced riders who cycle competitively to those who have only been cycling for five months, so it was important for us to support each other during the training and the final ride and enjoy a few beers in the process.